Answer: It can be chalk or paint, or a combination of the two. 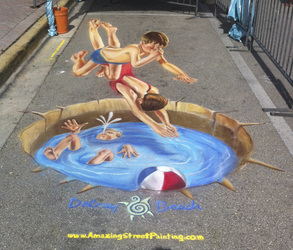 Streetpainting is usually chalk and paint on the ground. 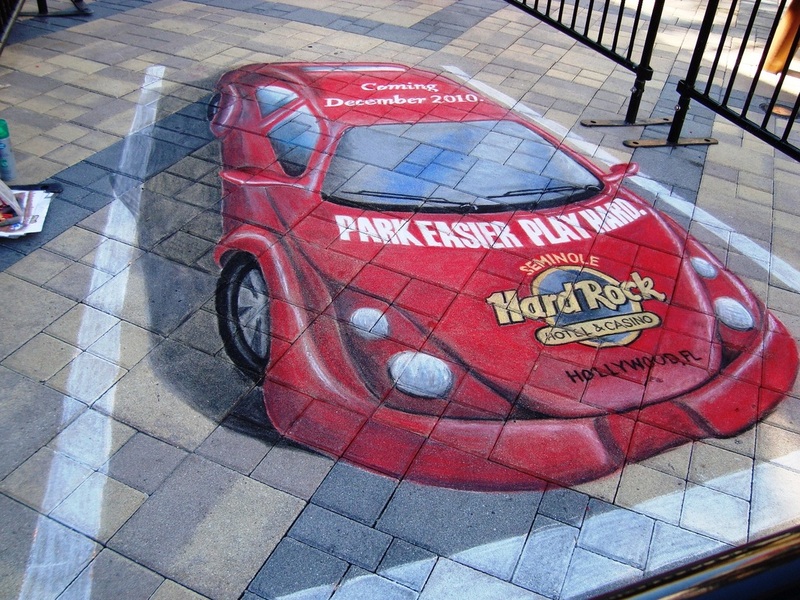 Click here to read more about the history of street painting. Amazing Street Painting creates custom interactive street art for special events. 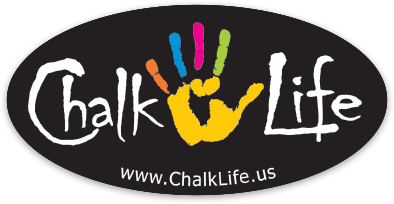 Chalk Life stickers now available through Sticker Mule. To see more products offered by Amazing Street Painting, ﻿click here﻿. I am a professional artist. This is what I do, all day, every day. Unfortunately, many projects I do are underfunded. If you'd like to donate to help defray costs of creating some of these large scale art projects, every little bit is much appreciated. And know that you are helping to make the world a more colorful place! If you want the best - you've just found it! Street Painting at special events can mean a lot of different things. See what my clients say! Sizes can range from 4' x 4' to 15' x 30' areas. These artworks always attract a lot of attention and return visits from customers and the media, making your event the talk of the town and on the internet. 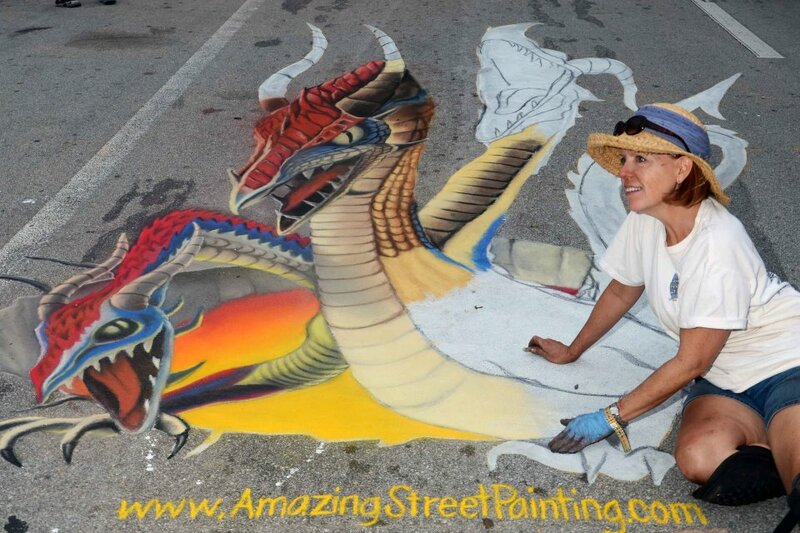 Click here to go to my contact page, or you can email me at amazingstreetpainting@gmail.com and I will get back to you quickly with a customized quote. 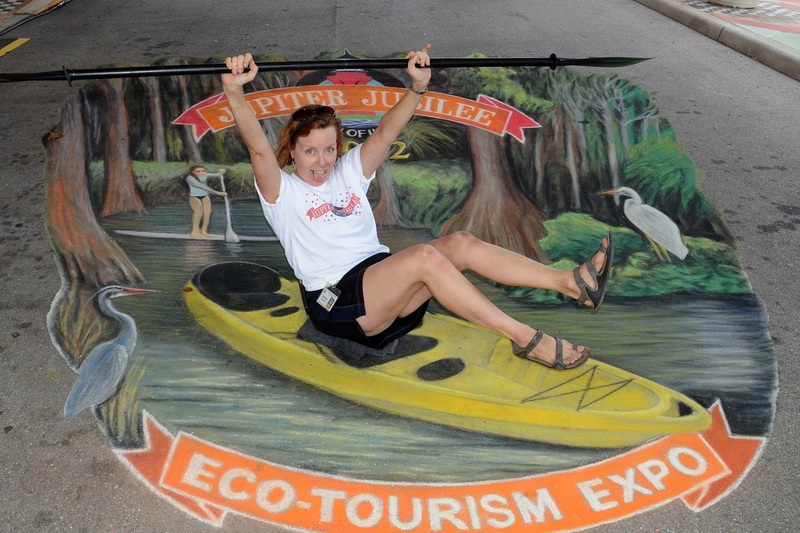 Street Painting Festivals are unique community events that have been gaining popularity for a variety of reasons over the past 20 years. Some events are sponsored by local merchants or the local chamber of commerce, and sometimes they are fund raising events for charities. These events are family friendly, earth friendly and attract visitors who love and support the arts. The audience is able to interact with the "performers" or artists in a unique way that makes the arts more accessible to all. Kids LOVE these events, and many offer an area for children to express themselves. They also encourage visitors to return more than once during an event, because they want to see the process and the progress of the art as it unfolds. I am available to help you put together an event of this kind, acting as a consultant and/or as a featured artist. Workshops and seminars are a great way to engage the next generation of artists in your community! I can lead workshops for all ages and skill levels of artists. Many artists want to participate and try this artform, but are intimidated and don't know where to start. Often I am brought in as the featured artist to a festival, and also lead a workshop or two before the event. Sometimes we do it a couple of days before the event, to give the artists a chance to use some of the techniques taught to help them prepare their art for the upcoming festival. The workshops (1-3 hours) usually involve a powerpoint portion inside, and then we go outside and do a demonstration of a small 3D piece, and then let students experiment laying out a small test picture and get some hands on experience with the chalk and how it interacts with the surface (sidewalk or street).